WCITD 2019 in partnership with the American Diabetes Association (ADA) will convene clinicians, scientists, and policy makers to discuss the latest research findings on diabetes surgery. The World Congress on Interventional Therapies for Type 2 Diabetes (WCITD 2019), in partnership with the American Diabetes Association (ADA), will take place for 4th time on April 8-10, 2019 in New York. WCITD 2019 will convene clinicians, scientists, and policy makers to discuss the latest research findings on metabolic/bariatric surgery and novel interventional therapies for type 2 diabetes. The Organizing Committee is led by Francesco Rubino (Congress Director), together with Philip Schauer, David Cummings, Lee Kaplan, William Cefalu (Program Co-Chairs). The first three editions were held with the participation of world leading experts, including Nobel Laureates, and with attendees from over 60 countries. 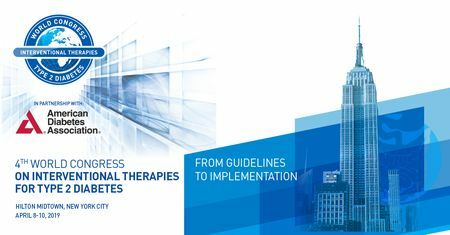 The upcoming congress will build on the success of previous events, with a focus on providing access to cutting-edge treatment and moving forward From Guidelines to Implementation. Join us April 8-10, 2019 in New York!